"Tell me, are you having a boy or are you having an abortion?" 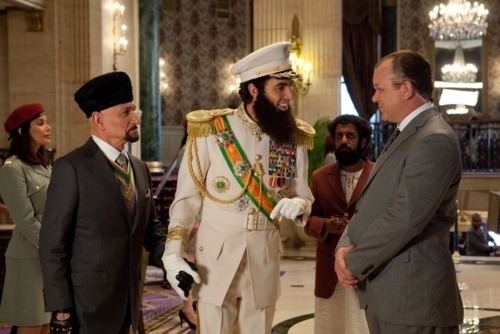 Baron Cohen plays General Aladeen, the ruler of the fictional North African nation of Wadiya. The film opens with a Frontline-style news brief about Aladeen's history and how his leadership has now pushed the country to the brink of enriching weapon's grade uranium. When The United Nations threatens Aladeen with sanctions and inspections, he must go to America and present his case to the UN, but a funny thing happens on the way to the UN. 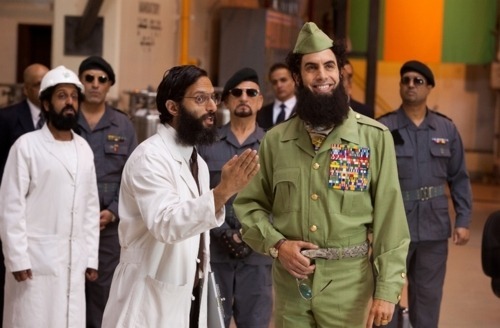 Aladeen's closest adviser and jealous Uncle Tamir (Ben Kingsley) plots to have Aladeen replaced with a double (an uneducated goat farmer, also played hysterically by Baron Cohen), who will deliver a speech to the UN proclaiming that democracy will come to Wadiya. This will allow Tamir to sell off the nation's oil reserves to various foreign interests which will give him a lot of money. Aladeen is to be tortured and killed, but in a series of mishaps, he escapes, albeit without his trademark beard, and is forced to fight his way back to power and expose his uncle. Aladeen takes up with an old ally living in New York, Nadal (Jason Mantzoukas) as well as falling in with a vegan feminist Zoe (Anna Faris) who gives Aladeen a job working in her organic co-op market in Brooklyn. The plot is almost an afterthought, as it is mainly a series of funny bits strung together, only returning to the main plot when they fear the audience may have forgotten about it. Of course, Aladeen finds himself falling for a woman who stands for basically everything he's against, and that will give him the change of heart he needs to make his third act conversion complete. The film is full of hilarious bit players, some of whom are woefully underused. Among the great supporting cast are John C. Reilly, Garry Shandling, Fred Armisen, J.B. Smoove, Kevin Corrigan, Chris Elliott, Bobby Lee, Kathryn Hahn, & two hilarious cameos I won't spoil. The problem is that most of them, with the possible exception of Reilly & Lee, are given very little to do, and outtakes during the credits hint at some of the larger bits they were involved in that wound up being cut. Charles keeps the film moving, and it breezes by in only about 80 minutes, just enough time to hit all the major beats and not overstay its welcome. Thankfully, the trailers and commercials have only shown bits that reside in the first half of the film, so there is a lot of material that they've kept under wraps, but I guess my biggest issue was that so many of the film's targets are pretty low-hanging fruit. Granted, a comedian of Baron Cohen's stature has never tackled taboos about terrorism & Middle Eastern Xenophobia in a major motion picture, but it's relatively easy stuff. It played great to the crowd full of (mostly) white teenagers and twenty-somethings in my Suburban Illinois theater this evening, but I doubt any of them really laughed because they were challenged by their own prejudices in the way Borat & Bruno did. I could nitpick, but at the end of the day, it's still a damn funny movie. The helicopter scene from the trailer is expanded and works gloriously well, as does a bit set in a funeral home, but some bits overstay their welcome like the child birthing scene and the seemingly endless gag of him making up fake names based on the signs he sees around him. The supporting cast is great, but Mantzoukas is the stand-out here. Anyone familiar with his work from The League or the awesome podcast "How Did This Get Made" will have a level of familiarity with him, but hopefully this will open him up to the larger audience he deserves. Baron Cohen is solid, but it's funny, I thought he actually excelled in the role of Aladeen's double more than he did as Aladeen himself. Maybe because it was something different, which I always love, but he really infused that character with a ton of pathos. At the end of the day, you'll know whether or not you'll want to see the film and, most likely, whether or not you'll enjoy it, based on your love (or lack thereof) for what Baron Cohen and Charles do as a team. I enjoyed this about as much as I did Borat, which I thought was brilliant, but I am an unabashed admirer of Bruno, and I think that's his best work. Bruno held a mirror up to a homophobic society at its most homophobic, and really made people confront what they were willing to tolerate, and it's a great litmus test for how "tolerant" people claim to be. Watch it with someone who says that they're "fine" with gays and see how quickly they're willing to squash it. But I digress... 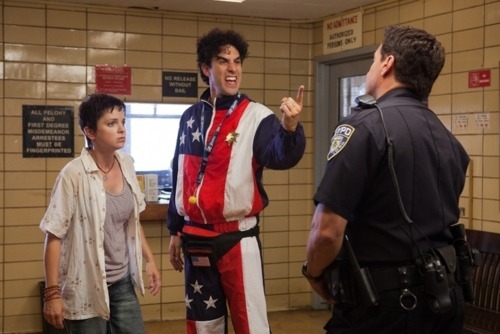 The Dictator is very funny, and has lots of laugh out loud moments that you'll be laughing about long after the film is over. Just don't be surprised if you find yourself wishing there had been just a little more to it. Baron Cohen is a brilliant social satirist, and I wish he had bared his fangs slightly more, and really let some groups have it that truly deserve it. But I guess I'll have to settle for a baby step in the right direction.